He could perhaps have been racing on a track this past weekend – but he wasn’t. Tragically, 27 year old Joshua Rehm was killed, on the public highway, yesterday (March 5), in Ridgeway, Wis. The native of Plymouth, Mass. was a twice Formula Dodge Champion, and was involved in Rolex competition in the maiden race of the DP era – the 2003 Rolex 24, in which he shared Darius Grala’s Fabcar Toyota, with Oswaldo Negri and Guy Cosmo. Negri had a big accident on Saturday and walked away from it, but poor Joshua Rehm didn’t walk away from his. 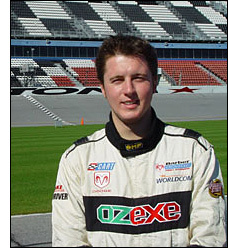 He last competed at the Rolex 24 meeting this year, in the Grand Am Cup race in Rehagen Racing’s Mustang. Just 27 years old: deepest sympathies to his family and friends.